Bless your heart is not really a compliment. It sounds sweet as pie, and sometimes is said affectionately about pitiable situations, but it’s often acid-tongued because you’re pitiful and did something you shouldn’t’ve but were too dumb to know better, which is why it’s a perfect saying to export from a region that has hung on for dear life to its manners because it has little else to boast about that isn’t problematic, like the food, or the music. Hell, the manners are problematic, too. Some people call it “nice meanness,” but the ability to sound proper while being awful is a central tenet of Southern identity, and you see it best these days in their holdover sick burns. Yesterday, for instance, Jennifer Garner, who was born in Houston, announced that she is releasing her memoir titled Bless Your Heart. In other words, she is too polite to say she thinks it’s tacky as using a Bedazzler on a cashmere sweater. So she uses a blow-softener. A sour candy dipped in sugar. A “verbal stiletto.” And why not, when ‘bless his heart’ does two jobs in one? It’s a very satisfying way to criticize someone while being able to act like someone who is above doing that sort of thing, because you’re so polite and all. You get to have it both ways: the sick burn sticks to them, and you’re Teflon. Remember when President Trump dinged former South Carolina Governor Nikki Haley by saying she was an embarrassment to the state? In the South, where politeness reigns among good people, you have to put your judgments somewhere. It’s not polite to speak ill of people if you were raised right. And it’s a way to excuse yourself from being rude, even though you’re being rude. It just doesn’t sound like it. But for some reason, the saying “bless your heart” has caught on elsewhere, and people are fooled by it unawares, because it sounds like someone is giving you the Gesundheit of well wishes. The two guests, Ellen DeGeneres and Patrick Wilson, both Southerners, had to break it to him that it’s an insult. “‘You poor, stupid person,’” DeGeneres explained. “It’s like that,” she says, referring to the way she condescendingly patted his wrist. “I took it as, ‘Oh my god, she wants to bless my heart, this is beautiful,’” Corden said. For instance, the first time I heard it was from my second-grade teacher. One day I wore shorts to school in the winter with sandals and socks. Which was pitiful, because we were poor, but clearly also stupid, because my mother let me go to school like that, and dressing for the weather is kind of a 101 skill. My teacher covered all these bases with one saccharine phrase. And that’s the whole thing about it: It sounded really sweet! That’s why it’s so devastating. What it means is that the speaker thinks you’ve gotten yourself into a bad situation, but part or all of the reason is something your fault — either a choice you made, or the fact that you’re dumb. The sympathy is because you probably can’t help it. Or as we say in the South, you come by it honestly. As in, your parents are dumb, too. But the person is a well-mannered polite person, and they are too polite to say it, or they actually like you anyway. Even though you’re stupid. Kind of generous, right? Like when my sister was riding her bike one summer in sixth grade and decided to steer with her feet, breaking both arms and one finger, and had to spend the summer walking around with two arms upright in a cast and a third finger bandaged as if she was flipping everyone one off. That’s a bless her heart situation. Scarlet: Oh honey, bless your heart, but that’s only 4 fingers. Scarlet: Child….Bless you and your momma’s heart. But the thing is, and here’s the twist: Sometimes it’s sincere. You could say it to someone you genuinely feel for who is in a bad place because they are pitiably weakened and you feel badly for them. Like their dog dies, or the house is destroyed by a tornado. You’d usually know from the tone, which tends to be empathetic or sassy. Some Southern women say they never hear proper Southern women use it negatively at all, only sincerely, and this is probably part of the confusion in its exporting. It means enough things to enough people that if unfamiliar, you won’t know what hit you, and that will be fine, because you don’t even know what we got away with. “It’s an expression that has a couple of different implications that go with it, a couple different meanings,” Kirk Hazen, a linguistics professor at Western Virginia University and expert on American dialects, tells MEL by phone. Sociologist Lisa Wade might categorize this as “weapons of the weak” — what she says women do when they can’t throw their weight around as men do, but need to exert power. But the phrase is not well understood outside of the South because the meaning as Southerners know it is a kind of insider knowledge that is learned, or an “in-term” that reveals your regional roots (if your accent doesn’t). You typically only know you’re being politely dinged if someone explains it to you. In a way, the strength of the phrase is the way it straddles insult and empathy so well, which makes it wonderfully versatile. Hazen is from Detroit. 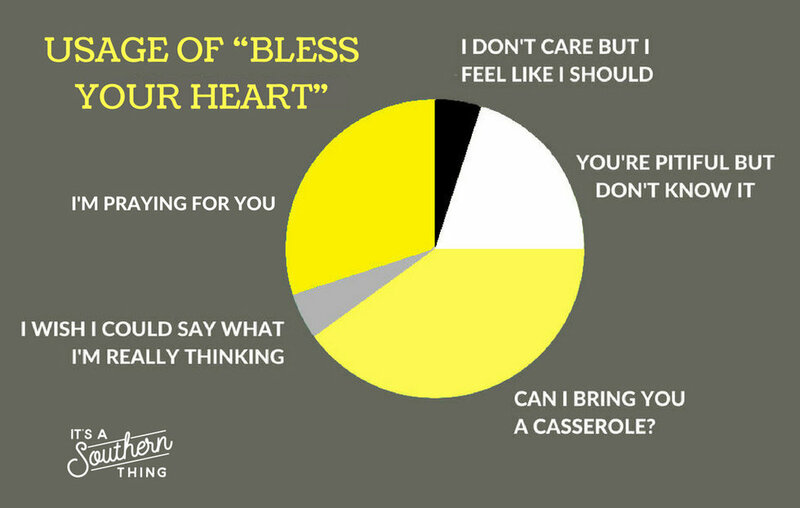 He compares “bless your heart” to the phrase “y’all,” which has also spread out from the South and is loved by lots of people for its folksy charm. While “y’all” is a gender-neutral way of addressing a room (as opposed to “you guys”), Hazen says, the gendered nature of “bless your heart” makes it feel performative for him to use. But if you’re trying to figure it out, the only thing to ask yourself is this: Did you just do something really stupid or not? If you don’t know, the answer is yes. Which means the ‘bless your heart’ you just got is the bad one. Sorry. I’ll pray for you.